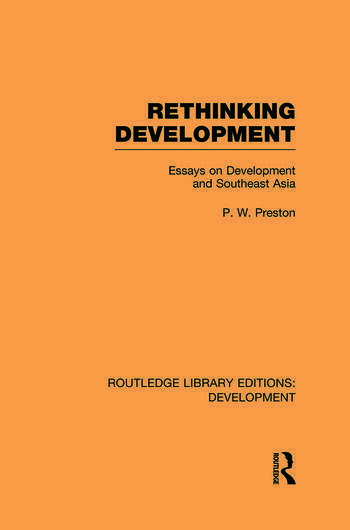 First published in 1987, this volume stresses the importance of development studies for sociology, as P. W. Preston argues that this field of study is emerging from the technical social scientific ghetto back into the mainstream of the ‘classical tradition’ of social theorizing, represented by Marx, Weber and Durkheim. Preston discusses the position of development studies in relation to the wider group of the social sciences in general and to sociology in particular. Using examples mainly from the study of Southeast Asia, he looks at the diversity of available ‘modes of social theoretic engagement’ and considers the work of the colonial administrator scholar, the humanist academic scholar, and the scholar who theorises on behalf of the planners, discusses the mode of political writing, and Marxian analyses of development; and considers the particular problems surrounding the elites of post-colonial ‘nation states’.